Oregon's assisted suicide report for 2013 has been released to the public. Per the report, the number of deaths from ingesting a lethal dose is low when compared to overall deaths, just 71 out of 32,475 total. The report is nonetheless significant for the following reasons. Per the report, some people who died from a lethal dose under Oregon's assisted suicide act had chronic conditions such as diabetes. People with these conditions, and other conditions such as cancer, can have years to live. Jeanette Hall, the woman in the photo, had cancer and was talked out of assisted suicide 13 years ago. Her doctor convinced her to be treated instead. Legalization, regardless, encourages people with years to live to throw away their lives. "Elders’ vulnerabilities and larger net worth make them a prime target for financial abuse . . . Victims may even be murdered by perpetrators who just want their funds and see them as an easy mark." "New figures show a sharp rise in suicides among middle-aged Americans, and an even bigger increase in Oregon. A Centers for Disease Control and Prevention report shows suicides among men and women aged 35-64 increased 49 percent in Oregon from 1999-2010, compared to 28 percent nationally." This "significant increase" is consistent with a suicide contagion in which legalizing one type of suicide encouraged other suicides. The new Oregon report also lists "concerns" as to why the people who died requested the lethal dose. The data for these concerns is originally generated by the prescribing doctor who uses a check-the-box form developed by suicide proponents. One listed concern is "inadequate pain control or concern about it." There is, however, no claim that anyone who ingested the lethal dose was actually in pain. A copy of Oregon's new report can be viewed at this link: http://choiceisanillusion.files.wordpress.com/2014/01/year16-2013.pdf For more information, please see the footnotes below. 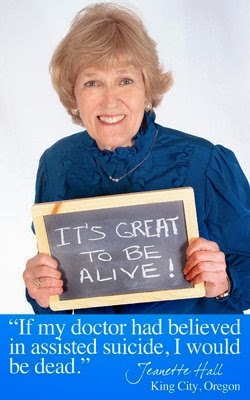 Margaret Dore is an attorney in Washington State where assisted suicide is legal. She is President of Choice is an Illusion, a human rights organization opposed to assisted suicide and euthanasia. She is one of the attorneys of record in the Montana assisted suicide case, Montanans Against Assisted Suicide (MAAS) v. Montana Board of Medical Examiners. The case has already resulted in the removal of an official policy statement implying that assisted suicide is legal in Montana. For more information, please click here. Funds are needed for an upcoming appeal to the Montana Supreme Court. Please consider a generous donation to MAAS and/or Choice is an Illusion, by clicking here and/or here. Thank you. Id., Report, page 2, first paragraph and footnote 1. Id., Report, page 6 (underlying illness, listing chronic conditions such as "chronic lower respiratory disease" and "other illnesses"). See also page 7, footnote 6 (listing "diabetes mellitus"). Report at note 1, page 2, last full paragraph. Oregon's Death with Dignity Act Report at note 1, supra, page 2, paragraph 2. News Release, "Rising suicide rate in Oregon reaches higher than national average," Christine Stone, Oregon Public Health Information Officer, Oregon Health Authority, September 9, 2010. Report at note 1, page 6 (middle of page).